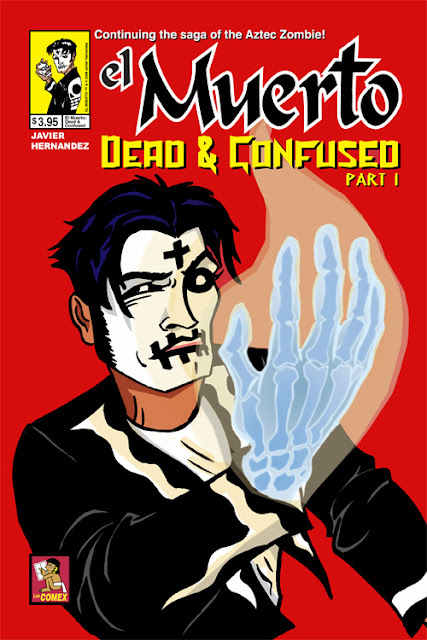 EL MUERTO RESURRECTION: New comic gives renewed life to a series. 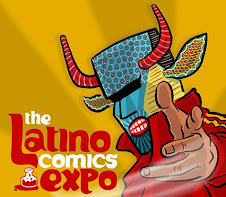 This is the new comic book I'll be premiering at the upcoming Latino Comics Expo this August 6 & 7 in Long Beach, CA. 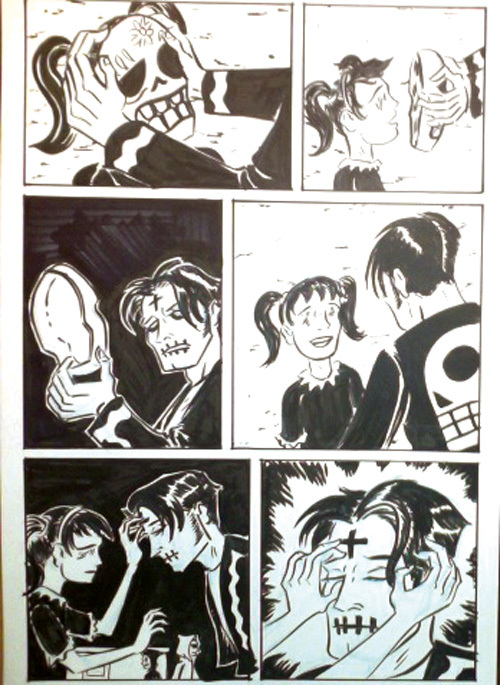 : El Muerto Resurrection. This is in fact the exclusive cover that will be available at the show. 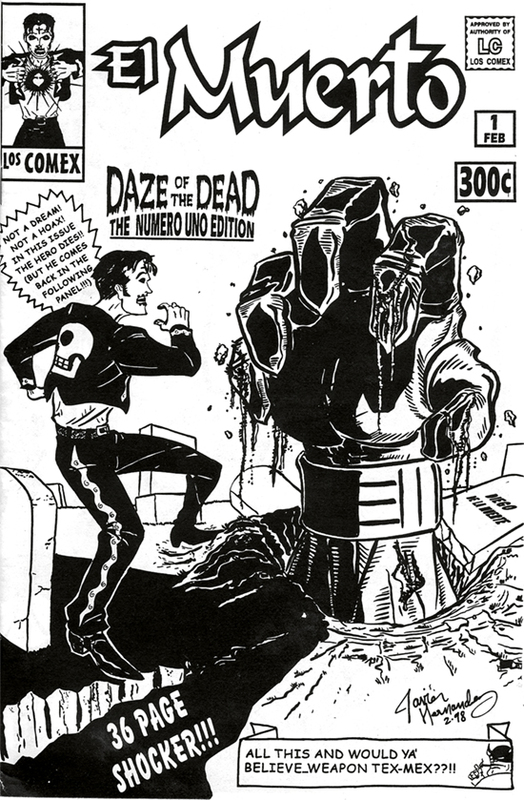 So my plan was to collect the earliest two El Muerto comics (seen below) and both Parts 1 and 2 of DEAD AND CONFUSED into a paperback collection and finally present to the world the complete initial story to El Muerto. I know that ultimately I'm making the right decision for the material. I always criticize whenever someone goes back and tries to fix old work (filmmakers like George Lucas come to mind). 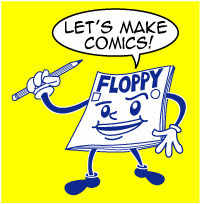 But here I am presenting a new work, a complete graphic novel, so I feel the best thing to do is provide the reader with the best experience possible. 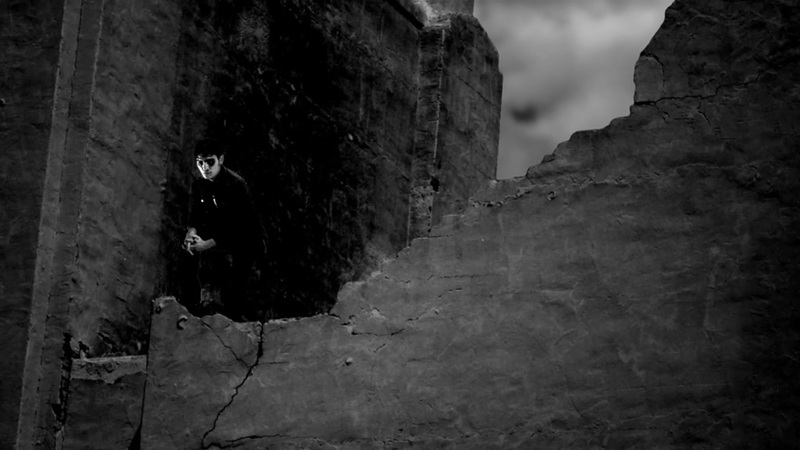 Comic book storytelling isn't hindered by money or technology, like a film might be. One improves as a writer and an artist, and it's that reasoning that allows me to want to make my story as cohesive as possible. 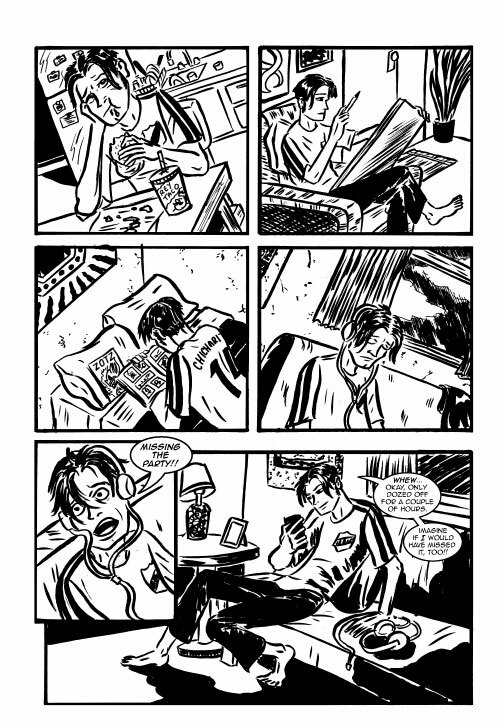 There will be a section in the middle of this book that was done in 2008 (Part 1 of DEAD AND CONFUSED), but with some minor touch-ups I feel they'll blend in with the new material. I guess the reader will have their own opinion, ultimately, but on my end, as the creator, I'm putting out something I believe in. So stay tuned here for more updates, as I'll be announcing a pre-order campaign shortly. It's not a reboot or a re-imagining (not my favorite words, by a long shot! ), but it's bringing new life to an existing idea. 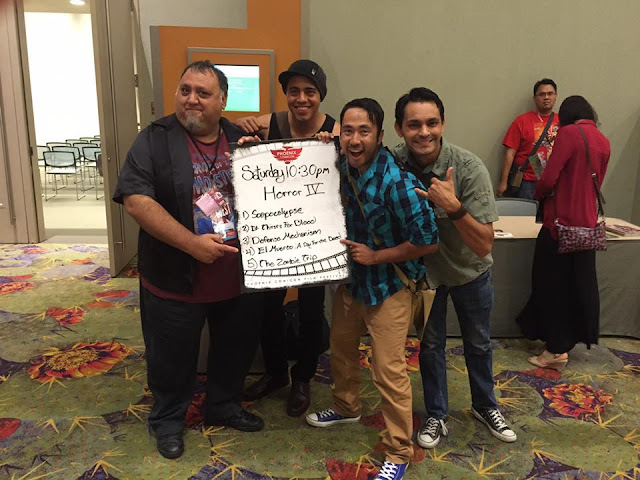 Last May, as I was preparing to attend the Phoenix Comic Con, I received an email one night. 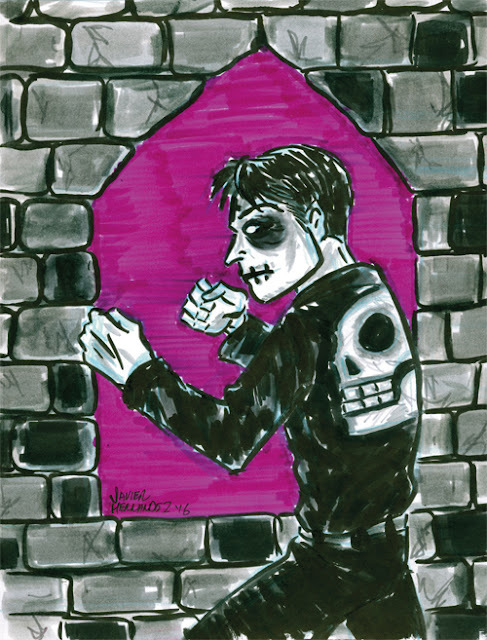 It was from a young filmmaker from Phoenix, Elijio Carlos Ramirez, informing me that he had created a fan film based on my character EL MUERTO! He was going to be screening it at the convention, and was inviting me to attend. The night of the screening I was rushing back to the convention center from my hotel, running into conflicting One Way streets at every turn. At one point I was heading down one of them, a pedestrian yelled out "You're heading the wrong way!". I eventually made it to the screening in time, sitting down as a few of the other shorts were playing. 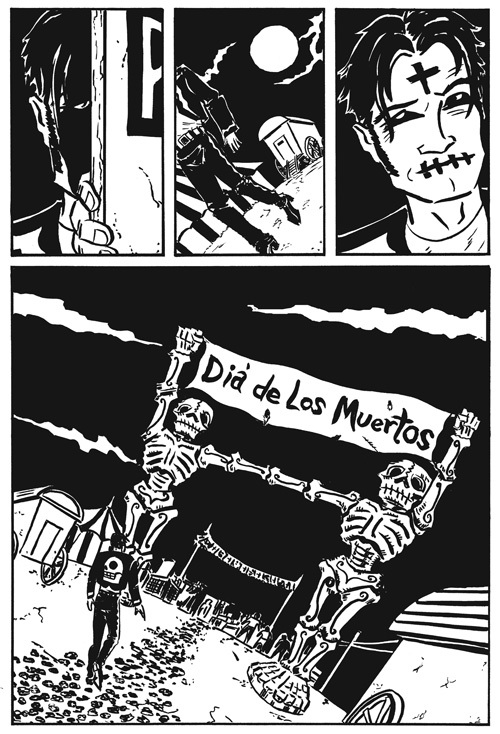 Once "EL MUERTO: A DAY FOR THE DEAD" started, a complete wave of anticipation gripped me. 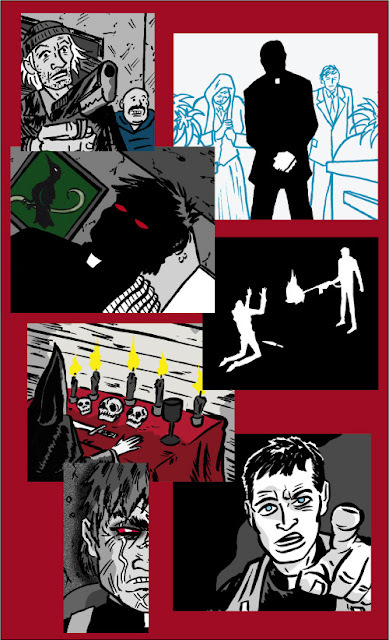 Having worked on the full length production of the adaptation of my comic back in 2005, being intimately involved in every step of production (including a cameo! ), my curiosity in seeing a film done without any participation from me was high. As the film played on, I took delight in the interpretation, and the sheer bravado on display in the production. Afterwards I met the director and two of the stars, thanking them for their work. One of the truly wonderful surreal moments I've had since creating the character back in 1998. ECR: Ha ha, sometimes I wonder who I am too! I guess the most basic answer is that I'm a creative out here in Phoenix, AZ who's just trying to promote production in my home state. And the best way I know how to do that is by trying to produce projects locally. In your youth, which movies or filmmakers sparked your interest in filmmaking? ECR: I think like any child of the 80's I was strongly influenced by pop culture: Saturday morning cartoons, Star Wars, comic books. I loved Tim Burton’s 90’s-era aesthetic, how it played with shape and proportion. 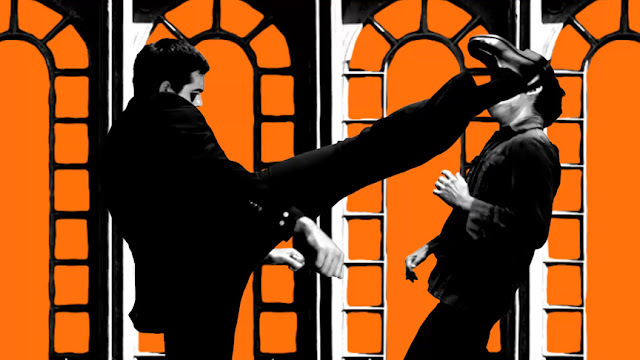 Quentin Tarantino’s “Pulp Fiction” has such a pop intensity that it really fired up people’s imaginations, mine included. And I loved Julie Taymor’s embellished realism in “Titus” and “Frida”. 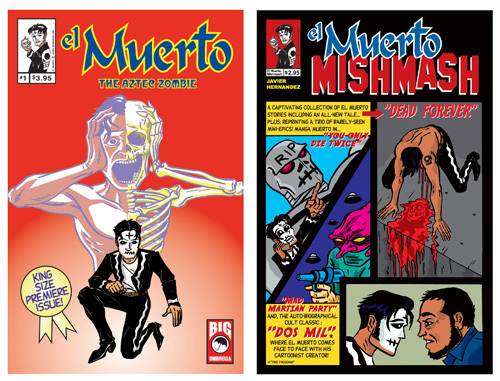 How did El Muerto get on your radar? ECR: It was around the mid-2000's when superhero movies were really starting to catch fire. I knew that I wanted to do something cool and action-packed like that, but I wanted to build it around a Latino property. But it also had to be something I knew I could actualize with the skills that I had, so… sorry Living Lightning! I can’t create a person made of electricity. Then after going through racks and searching online I eventually found "El Muerto". I read as much as I could find about the character, the comic, and the mythology, and I thought it would make a great film. And then later I found out they already made one! But mine was different enough so we went for it. What drove you to make '"El Muerto: A Day for The Dead"? The film's got some quality production value behind it. ECR: Thanks! What I liked about “El Muerto” was that, besides being a great comic with this awesome black-and-white neo-noir style, I felt that it really said something about the origins of Latinos in North America. You have this young kid who dies but is called to the Aztec underworld of his ancestors and is sent back to earth with the cross on his forehead, which calls back to Catholic rituals, while dressed as a mariachi. It blends so much of our archaic, historic, and modern identities, and up until recently there hasn’t been anything in pop culture that did that. You have it now with movies like “Book of Life” and Disney’s “Coco”, but El Muerto came out before all that. When I was planning the film, I felt it was very important to make something that would make a good story and had a lot of production value behind it, because otherwise it wouldn’t be taken seriously. “El Muerto” has a great origin story but the series was left open-ended enough that we could build on it. We took some creative license, obviously, but I think we stayed pretty true to the character. The film is concise and packs a great punch. Is the final cut the original idea you had, or did you alter your story. ECR: The final cut is actually a very close approximation to my original idea. We didn't have much of a budget, so there were some things that we weren’t able to include. 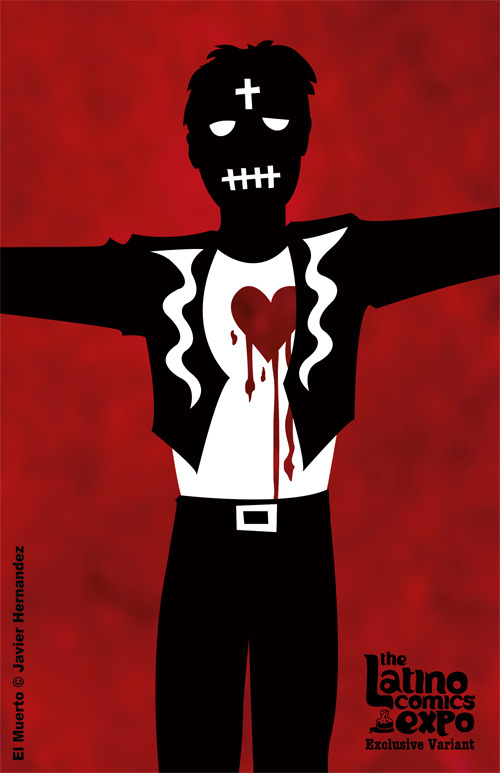 I had wanted to include a scene where Diego digs himself out of his grave, partly catatonic, and pulls open his shirt to show that his heart was cut out of his chest. It would have tied the character more closely back to the original comic where the character clearly receives a cardioectomy, but we just couldn’t make it happen. There was another scene I was actually inspired to add while we were filming! 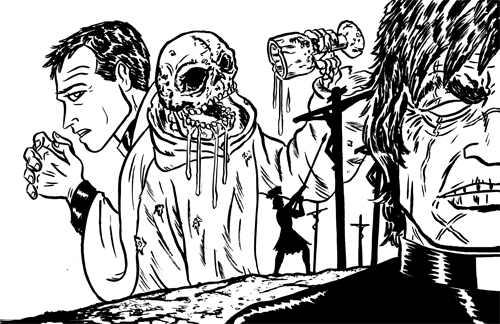 I wanted to add an origin scene for the main villain El Vivo. 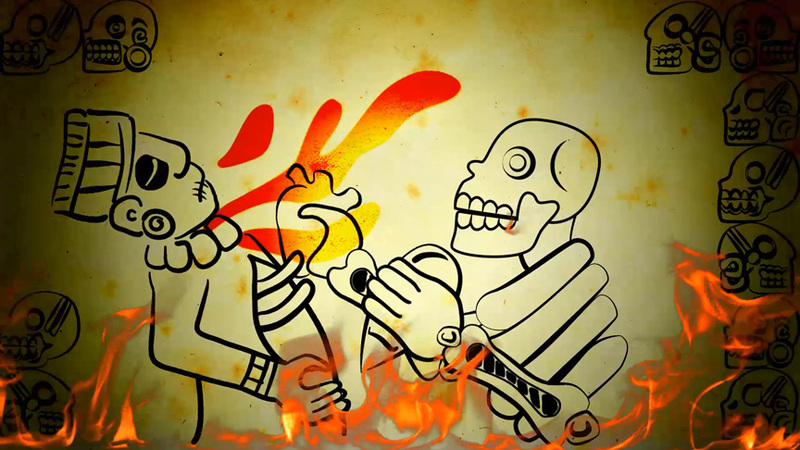 In the film, spoiler alert, it turns out that El Vivo is actually another Aztec Zombie! I’ll admit I didn’t know much about the character but based on the doll that was made for him, I had to draw my own conclusions. The story that I built for him was that he was actually a 16th century Spanish conquistador who was responsible for massacring scores of Aztec natives. So as punishment, they perform the ceremony of undeath on him and remove his heart, forcing him to walk the earth for eternity. I thought that really would've tied a lot of the story together, but filmmaking is a collaborative process with a lot of moving parts so even though we tried (really, really hard) to pull it off, sadly, the stars did not align in our favor. So… end spoiler! A lot of the movie is done digitally. I imagine that while time consuming, it definitely helps in cutting down on expensive location shooting. ECR: Ha ha, yeah, going digital cut down on location expenses, but it definitely presented its own challenges. We shot the whole film in a green screen studio so I spent plenty of time in front of my computer working in After Effects pulling keys, rotoscoping, and basically using every trick I could think of to remove the background from the characters. It is definitely not as easy as it looks! But I knew I wanted to use Phoenix as my setting. I really wanted to show off the visual appeal of all the midcentury architecture in our downtown area, which made the setting seem more timeless. So I went out and took pictures to use as backgrounds, but the challenge was taking pictures from the same angle from which the actors were filmed. That required the occasional use of a ladder or some light climbing and a few casual explanations to City of Phoenix police officers. Any particular problems, or pleasant surprises. that arose during production? ECR: The most pleasant surprise was how readily this project came together! At the time, I was working for a great production company here in AZ, Point In Time Studios, that worked closely with another company, Arizona Virtual Studios (now it's Arizona Studios), and that gave us access to everything we needed. I had met the cast (Jacob Orta, Tess Hernandez, and Alejandro Sanchez Vega) as an actor working with Teatro Bravo, Arizona's premiere Latino theater company, and that gave me a deep well of talent that I could call upon. I had performed with another actor, Sarah Clevinger, on a show at Arizona State University and she revealed that she's also a very talented makeup and prosthetics artist! 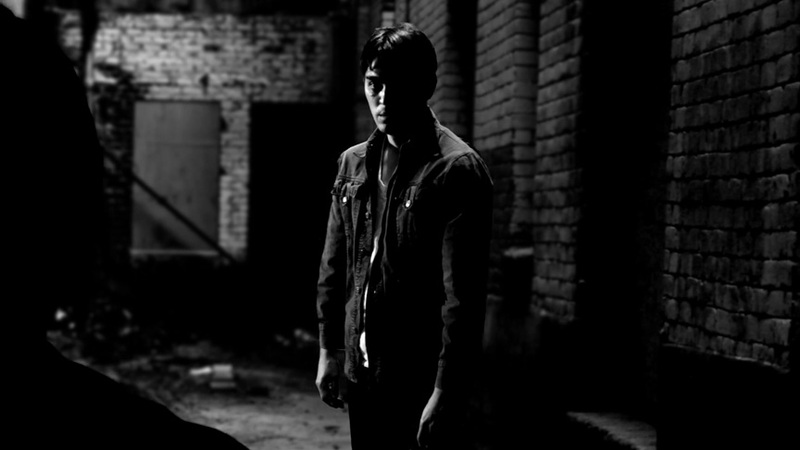 We found Ramiro Quezada when he came in to audition, and he had such a strong, brooding presence and great martial arts skills that I knew I wanted him to play the lead villain. The biggest problem we ran into was casting someone for the role of El Fuerte, one of the supporting villains. We really needed someone who could meet the physical demands of that character because if we didn't then the character wouldn't be believable and the short wouldn't be taken seriously. The first actor we cast dropped out two days before filming (because that's how these things work) so I started calling every single person I had ever shaken hands with to find a replacement. And mercifully (thanks to Miles Nuessle at NPC Miles Productions) we found Ryan Foxx, a competitive bodybuilder who was just everything we needed. He came in like a boss, all ripped and huge, and he just delivered! But the most heartening surprise was working with a great crew. Working as crew isn't easy and it's not glamorous, so not a lot of people are eager to do it. But working with Point In Time I met a lot of great kids who really wanted to pitch in and be a part of this project, and I was able to work with one of my mentors Ralph Lopez who really helped bring the whole thing together. You contacted me last year that you were screening it at the Phoenix Comic Con, and invited me to attend. Coincidentally, I was already scheduled to exhibit at the show. Did you have any trepidation when you emailed me about the creation of your film? ECR: I did, actually! When you do a fan film, you never know how your work is going to be received by the person or people who created the original property, especially considering that we took some creative license. But I was pleasantly surprised and, quite frankly, relieved at how open you were to the project. But everyone in the cast and crew has been very appreciative of the support you've shown for us and the film. Any future endeavors you care to share with us? ECR: Right now we're getting ready to submit the short to Comic-Con International's film festival, so if anyone is in a position to bend the ear of the selection committee, please put in a good word for us! Aside from that I'm keeping myself busy with a few other projects, and keeping an eye out for new films to produce. So here's hoping we can build on the success that "El Muerto" has brought us so far! Me with the director and cast of EL MUERTO: A DAY FOR THE DEAD. My thanks again to Carlos and his cast and crew for putting together an imaginative interpretation of my character. On it's own, it's a firecracker of a film, and inspiring in it's own right. I'm always glad to see others put their creative energies to use, and it also gives me a great personal satisfaction to see young Latino talent express themselves through their artistic efforts. Here's a piece of fan art I did the other day, in honor of their movie. 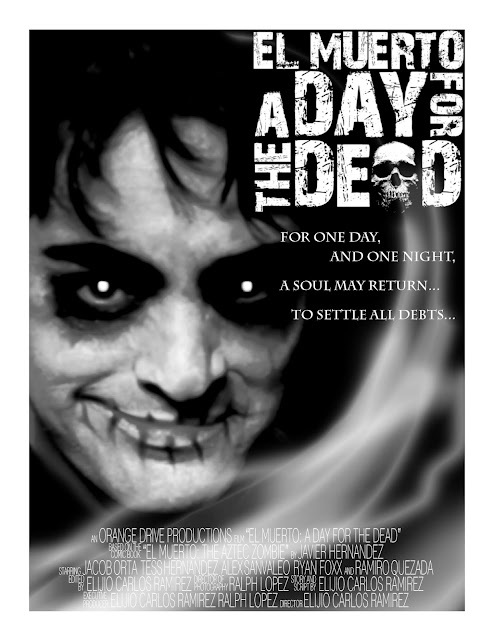 EL MUERTO: A DAY FOR THE DEAD is currently available to watch online. Click here to see it! 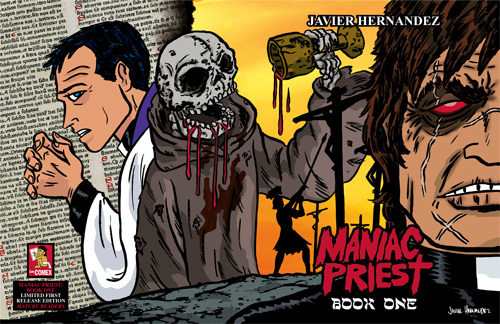 Pre-order MANIAC PRIEST: BOOK ONE! 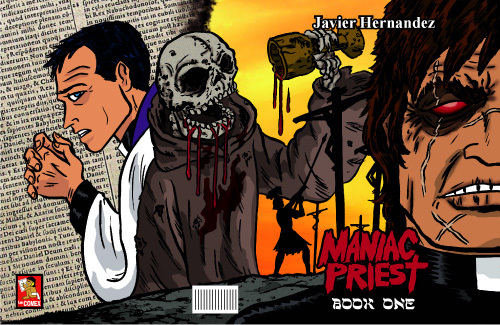 I'm now taking pre-orders for my new book, MANIAC PRIEST: BOOK ONE! Los Angeles, 1985.... The city's in the stranglehold of a crime wave. 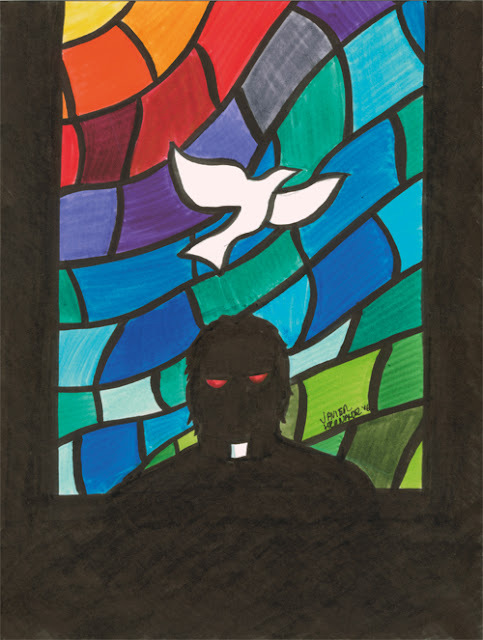 When the latest victims include the sister and niece of a young priest, a Biblical vengeance shatters the night! 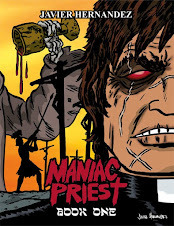 Maniac Priest....You don't confess your sins to him, you pay for them! Inspired by the vigilante genre (DEATH WISH, The Punisher, The Executioner), this new book is a mix of revenge story and supernatural thriller. 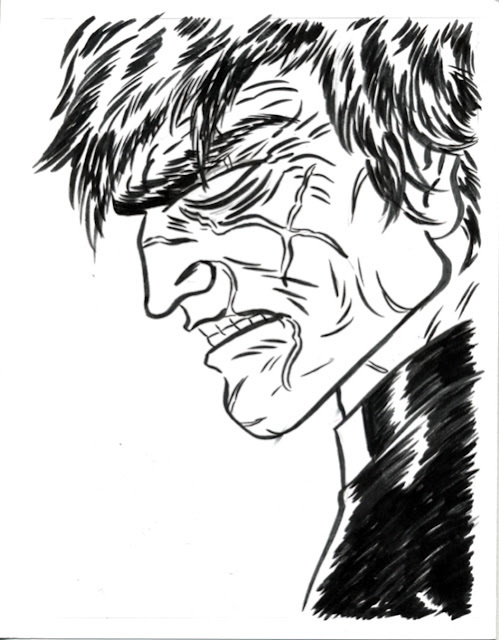 Featuring 4 stories, colored in gray tones with selected spot colors, the story of Maniac Priest is my first 'Mature Readers' release, in keeping with the genres that inspired it, as well as staying true to the subject matter. 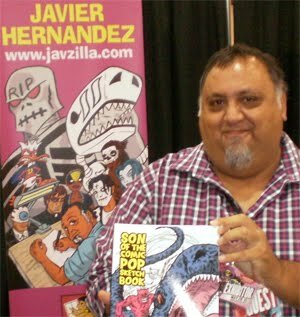 The book is 37 pages, 8.5" x 11" squarebound, and features guest pinups by a variety of cartoonists with diverse interpretations of the character: Pharoah Bolding, Brad Dwyer, Michael Aushenker, Eric Mengel, Rafael Navarro, Byron Black with Michael Neno, and Ofloda Monstro. Also features behind-the-scenes material on creating the character. Pre-order campaigns, which some of you have been so kind to support in the past, help me pay for the initial print run. So your patronage is greatly appreciated. (Think of it as a bit like tithing, but you'll get a cool comic in the end!). 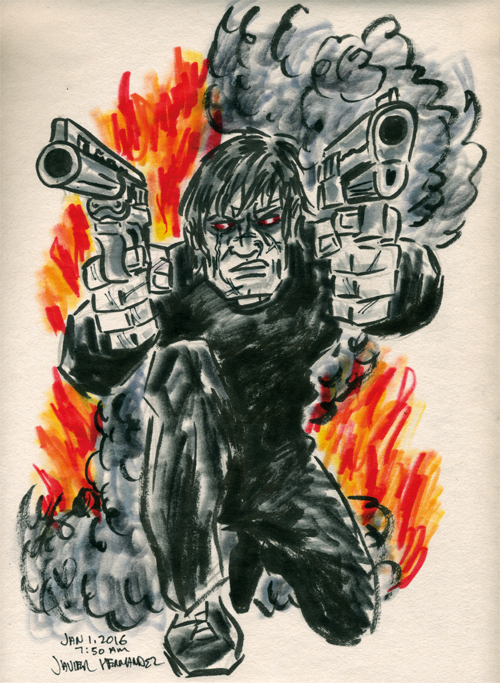 Every book pre-ordered will come signed with an original sketch in the book by me. I've also included several Artist Editions where in addition to a signed copy of the book, you can own some of my original artwork. One is a the colored marker drawing below and the other is a black & white ink drawing (this image is featured in the book). Follow me on Facebook, Twitter or Tumblr to see more updates and previews during the Pre-order campaign. To get your copy of the book, please visit my Los Comex webshop. Starting, and ended, the year working on a new book. Finishing up some pre-production work on it before I send it off to the printer for a proof copy.